I’m going to save you a lot of time. 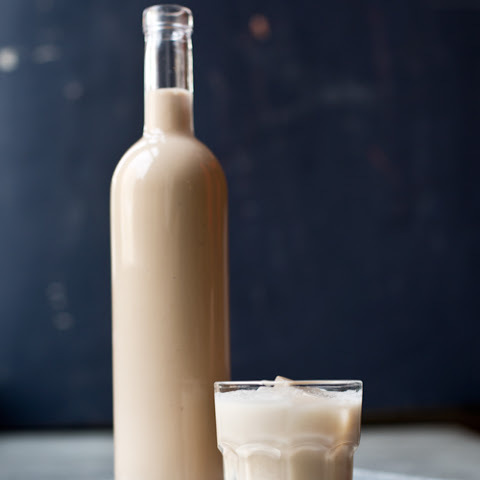 The post on making your own Irish Cream on The Modern Proper has some beautiful photos, the recipe itself is solid, but skip the post itself. It’s long winded and kind of pompous. I don’t know what else you would expect from something called The Modern Proper so give it a +1 for meeting expectations. The basic elements here are actually frighteningly similar to the crema limoncello I made for Christmas 2013. The core of the idea is that milk can be made semi-stable if you add enough sugar to the process. In the case of Irish cream you can save some time by buying a can of sweetened condensed milk or you can have some control over the sugar/fat content by making your own. Additionally the fat content of the cream will help to prevent the mixture from curdling. Condensed milk is really just simple syrup where you have substituted milk for the water. You do want to make sure that you don’t over-heat the milk or it will scorch. Additionally once you add the sugar you’ll want to keep the heat low or you’ll start to caramelize and again ruin the flavor. This is slightly more complicated than Modern Proper’s version. For one thing I’m going slightly less off the shelf and with a bit more than just a blender. Place milk in a small saucepan and bring it up to boil using a medium heat. Immediately reduce heat and slowly combine sugar and cocoa powder until they are fully dissolved. Remove from heat and allow to cool slightly. Stir in vanilla and coffee concentrate. When fully combined move to a mixing bowl (preferably with a pour spout), using stand mixer or hand mixer whip cream and cream of coconut until mixture is frothy. Lastly, add whisky slowly while whisking or stirring constantly. This is important. Whiskey is very acidic compared to milk and the change in Ph is the primary reason that milk curdles. The fat content of the milk and cream will help to buffer this until the mixture is fully combined but you don’t want to dump the whole cup of whisky in all at the same time. You can read more about the process here. Place in air tight bottles and refrigerate. It doesn’t really need it because of the alcohol content but it will last longer. If by some miracle the mixture does curdle all is not lost. Curdles in your product may be texturally undesirable but they do not mean that the milk has spoiled. Milk curdles on its own because it turns more acid as it ages. You might have to drink your own failure but it will still be potable. The result will likely be a bit thinner than you are used to from commercial products unless you either double down on the sugar content or reduce the milk more than you would otherwise. Using heavy cream won’t really thicken the product much but it will change the texture. Posted in Make Your Own.Tagged baileys, cream whiskey, creamed whiskey, crema, Irish cream, make your own, myo, simple syrup. Previous Post How Do I Ship Alcohol?